This page is about anthology calls for submissions. Looking for Novel, Novella, or Story Collection submissions? No Anthology Calls Currently Open. Check back again soon! For planning purposes, we're giving you this information ahead of time. Please submit ONLY during specified dates. More forthcoming anthology calls are still in development. Please check back soon! For reference only. Do not submit to these. Open for Submissions: January 1 -** March 11, 2019** Deadline updated! Solarpunk is a type of eco-conscious science fiction that imagines an optimistic future founded on renewable energies. Often aiming for a balance of nature and technology, and always inclusive and diverse, solarpunk stories show the ways we have adapted to climate change, or the ways we overcome it. For this anthology, I want to see solarpunk stories that take place in winter. That might mean working together to survive extreme blizzards, or feeling the heat in places that no longer see snow. Which renewable tech works best during long winter nights? How do solarpunk societies celebrate the winter holidays? Keep it planet-based (Earth or other), and optimistic. Solarpunk worlds aren’t necessarily utopias, but they definitely aren’t dystopias. We're a northern hemisphere publisher, but southern hemisphere winters are also welcome! Need inspiration? Read New York 2140 by Kim Stanley Robinson, the Sunvault anthology, or Glass & Gardens: Solarpunk Summers. Submission Method: Send your story as a .doc, .docx, or .rtf attachment to solarpunk[at]worldweaverpress[dot]com with Submission: [story title] in the subject line. Please include a brief cover letter, but DO NOT summarize your story in the cover letter. Simultaneous submissions: Yes, you may submit your story to other markets before you hear back from us. Please let us know ASAP if someone else accepts it. Multiple submissions: No, please only send us one story for consideration. Sarena Ulibarri is Editor-in-Chief of World Weaver Press, and she is also a fiction writer who has been published in Lightspeed, Fantastic Stories of the Imagination, Weirdbook, and elsewhere. Her solarpunk story "Riding in Place" appeared in the anthology Biketopia: Feminist Bicycle Science Fiction Stories in Extreme Futures, and another, "Chrysalis in Sunlight" is forthcoming in GigaNotoSaurus. She lives in a solar-powered adobe house in New Mexico, and can be found online at SarenaUlibarri.com and @SarenaUlibarri. She edited the anthologies Glass and Gardens: Solarpunk Summers and Speculative Story Bites. Dieselpunk and decopunk are alternative history reimaginings of the WWI and WWII eras beginning with the assassination of Archduke Franz Ferdinand and ending before the bombing of Hiroshima and Nagasaki. I’m looking for tales with the grit of roaring bombers, rumbling tanks, of 'We Can Do It', the Great Depression and old time gangsters or the glamour (real or imagined) of flappers, Hollywood starlets, smoky jazz, elegant cars and Radio City Music Hall. For example: a ‘mend and make do’ take on the Elves and the Shoemaker, a trench warfare version of The Emperor’s New Clothes, or Hansel and Gretel as Bonnie and Clyde. The possibilities are limitless. Original fairy tales are welcome, as are retellings. If you choose to retell a familiar favourite, make sure your story offers something new and interesting. I’d rather see stories that reflect the long history of fairy tales as social commentary than those which simply tell the same story with a different setting. And while dieselpunk tends to be focused on North America and Western Europe, this anthology needn’t be. I am open to stories set all over the world, and would love to see ‘Own Voices’ stories. Need inspiration? Check out The Mammoth Book of Dieselpunk, Amberlough, or Sky Captain and the World of Tomorrow. How to submit: Between August 1 and September 30, upload your story here: https://niteblade.submittable.com/submit Please mention in your cover letter whether this is an original fairy tale or a retelling, and if it's a retelling or mash-up which story or stories inspired it. About the Anthologist: Rhonda Parrish is driven by the desire to do All The Things. She was the founder and editor-in-chief of Niteblade Magazine, is an Assistant Editor at World Weaver Press, and is the editor of several anthologies including, most recently, Equus and D is for Dinosaur. In addition, Rhonda is a writer whose work has been included or is forthcoming in dozens of publications including Tesseracts 17: Speculating Canada from Coast to Coast, Imaginarium: The Best Canadian Speculative Writing (2012 & 2015), and Mythic Delirium. Her website, updated weekly, is at rhondaparrish.com. Baba Yaga, the terrifying witch of the forest in Slavic folklore, lends herself to all kinds of interpretations. 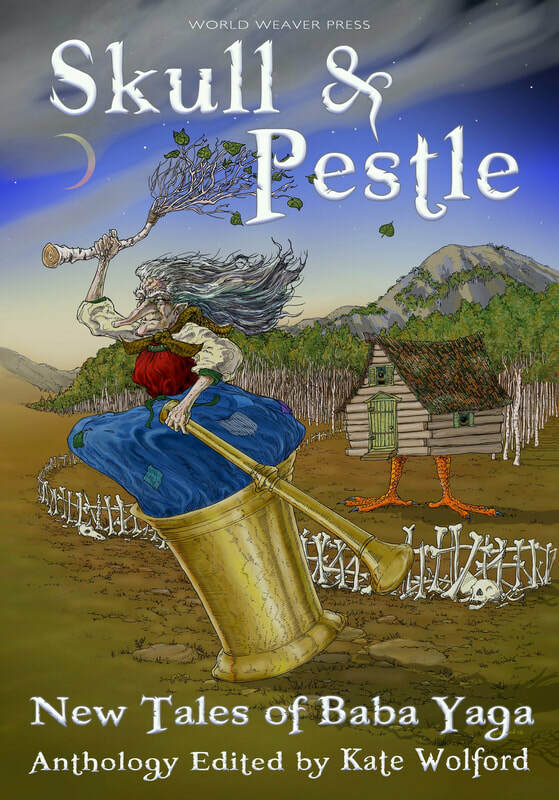 Notorious for traveling in a mortar while wielding a pestle, Baba Yaga sometimes wreaks havoc on humans, but can turn around and help when she feels like it. And she is an early Tiny House owner--hers moves on chicken feet. Baba Yaga may be recognizable from classic images by Ivan Billibin, but, in the US and some other countries, her qualities are not as widely known as they are in Slavic countries. A link to learn more is HERE. 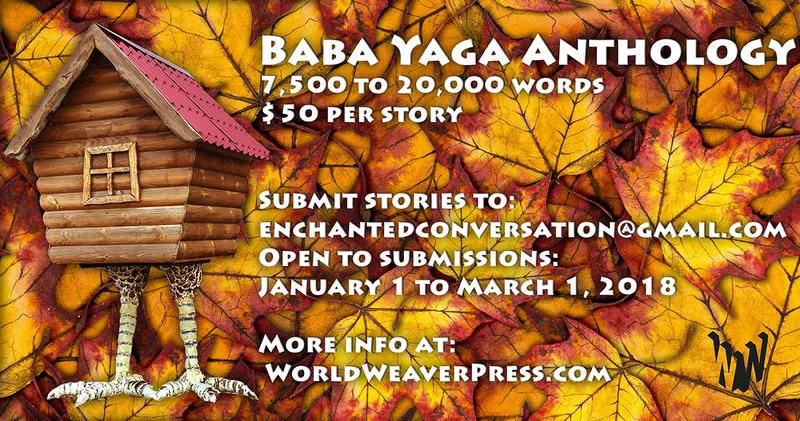 Kate is looking for stories from Baba Yaga’s point of view, or the point of view from those she helps or hurts, or from anyone who might be a protagonist worthy of the Baba Yaga story. You can set the story in the past or present. The story can take place anywhere in the world. It can include romance or action or tragedy or comedy. Kate wants well-developed stories that don’t disintegrate at the end because they’re rushed or major plot lines are unfinished. Develop characters. Draw readers in with specific details. Make them root for the protagonist. The audience is age 15 and up. Please, no sci-fi, dystopian, erotica, high fantasy, time-travel, futuristic, space travel, or western submissions. No love triangles, please. Kate will not provide feedback at any point during the submissions period. Submission Method: Send your story pasted into the body of the email. Attachments will not be opened. Please email with Submission: [story title] in the subject line. Please include a brief cover letter, but DO NOT summarize your story in the cover letter. Send submissions to ﻿Enchantedconversation[at]gmail[dot]com﻿. No multiple submissions. Just one per author. But simultaneous submissions are fine. No reprints, sorry! About the Anthologist: Kate Wolford is a writer, editor, and blogger living in the Midwest. Fairy tales are her specialty. Previous books include Beyond the Glass Slipper: Ten Neglected Fairy Tales to Fall in Love With, Krampusnacht: Twelve Nights of Krampus, and Frozen Fairy Tales, all published by World Weaver Press. She maintains a 'zine, Enchanted Conversation: A Fairy Tale Magazine, at fairytalemagazine.com. Solarpunk is a type of eco-conscious science fiction that imagines an optimistic future founded on renewable energies. It might take place in a wind-powered skyscraper or on a solar-powered robotic farm, in a bustling green-roofed metropolis or in a small but tech-saavy desert village. Often coupled with an art nouveau aesthetic, and always inclusive and diverse, solarpunk stories show the ways we have adapted to climate change, or the ways we have overcome it. 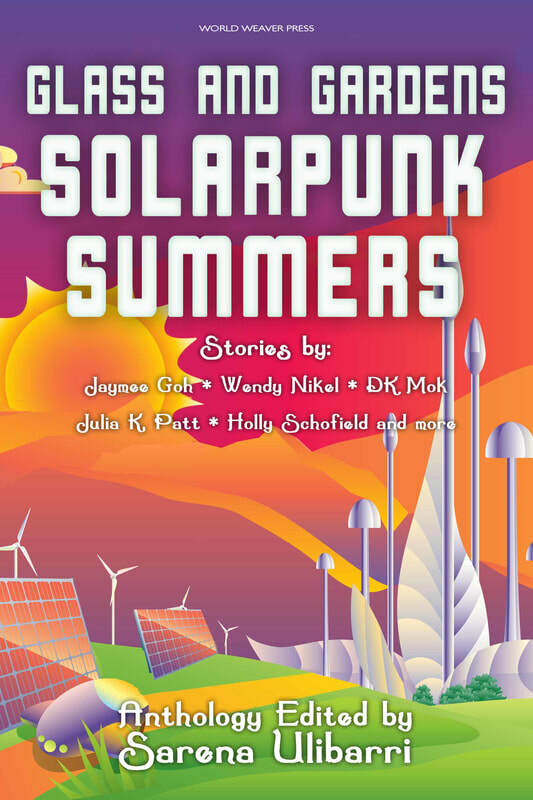 For this anthology, I want to see solarpunk summers. Show me futuristic stories that take place in summer, whether that involves a summer night in a rooftop garden, or characters adapting to extreme heat and weather, or an annual migration to cooler lands. Keep it planet-based (Earth or other), and optimistic. Solarpunk worlds aren’t necessarily utopias, but they definitely aren’t dystopias. We're a northern hemisphere publisher, but southern hemisphere summers are also welcome! Need inspiration? Read New York 2140 or Pacific Edge by Kim Stanley Robinson, Sunvault: Stories of Solarpunk and Eco-Speculation, or Wings of Renewal: A Solarpunk Dragon Anthology. About the Anthologist: Sarena Ulibarri attended the Clarion Fantasy and Science Fiction Writers' Workshop in 2014 and earned an MFA from the University of Colorado, Boulder. Her fiction has appeared in magazines such as Lightspeed and Fantastic Stories of the Imagination, as well as anthologies such as Biketopia: Feminist Bicycle Science Fiction Stories in Extreme Futures and Dear Robot: An Anthology of Epistolary Science Fiction. She has been Editor-in-Chief of World Weaver Press since 2016, and edited the anthology Speculative Story Bites. No one is perfect—not even a witch. Witches have amazing power at their fingertips to do unbelievable things. That magic can come in really handy sometimes too. They can make someone fall in love, poison an apple to enact a sleeping curse, to banish an enemy to an alternate reality, or just to conjure up some Nutella when there is none in the house. But what happens when those spells go horribly awry? SONOFAWITCH! seeks humorous stories of spells gone wrong. What spell fell apart and how did the witch get out of it? Give me a contemporary setting (mainly because it lends itself to more humor). The rest is up to your imagination. Submission method: Send story as an attachment (.doc, .docx, or .rtf only) to thompson[at]worldweaverpress.com. About the Anthologist: Trysh Thompson has written just about every form of non-fiction you can think of—everything from news, movie reviews, magazine columns, marketing hype, software manuals, and was even an editorial assistant on a gardening book no one has ever read (The 7-Minute Organic Garden—see, you’ve never heard of it, have you?). To keep from being slowly and torturously bored to death by her day job, she turned to fiction as means of escape—reading it, writing it, and editing it. Horses are represented in mythology and folklore from Paleolithic right up to modern times. What is it about these magnificent creatures that fascinates us and captures our hearts? Is it their intelligence, their power, their beauty, or something else that draw us to them? That is just one of the questions we’re going to explore in Equus. 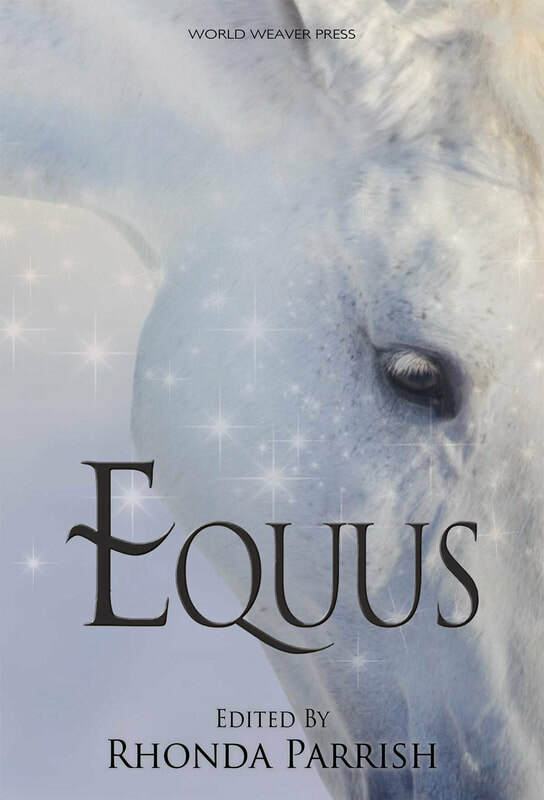 I will be looking for stories about every kind of horse from the earthly to the mythological and though I’ll be placing a special emphasis on horses, unicorns and pegasi, every kind of magical equine is welcome (and really, aren’t they all magical?). Stories with a strong sense of place will have an advantage, as will those which explore the connection (for better or for worse) between equines and humans. Submission method: Upload story as .doc or .rtf to niteblade.submittable.com/submit The editor will be reading submissions blind, so please remove your name and contact information from the manuscript before submitting. May 15, 2016-August 15, 2016 Deadline extended to August 31, 2016! Krampus, Santa's dark companion, is in the spotlight these days. Thousands of people across the globe celebrate Krampusnacht on December 5th of each year. And the movie, Krampus, was a hit during the 2015 holiday season. 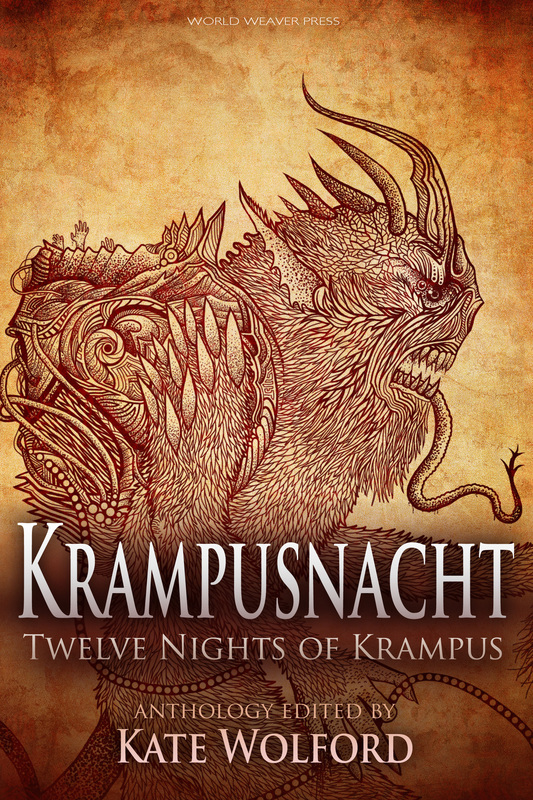 Krampusnacht: Twelve Nights of Krampus, which I anthologized and World Weaver Press published, was a hit as well. So, World Weaver Press and Enchanted Conversation are publishing another volume. For now, it's just called Krampusnacht Two. Remember, Krampus is the "corrective" to Saint Nick or Santa's indulgence and generosity. He carries a switch and chains, and sometimes throws very rotten children in a basket he carries on his back. He has horns, hooves, and a creepy, long tongue. He's horrible and fascinating at the same time. You can learn a lot about him from this site , and you should read Krampusnacht: Twelve Nights of Krampus as well, to see what we like. But we are interested in new, fresh stories, not retreads of what we have already published. We’re looking for short stories that explore every possible Krampus angle. He’s a nasty old dude, and we hope your imaginations will get the better of you. Rights and compensation: Payment: $10 and paperback copy of the anthology. We are looking for previously unpublished works in English. We are seeking first world rights in English and exclusive right to publish in print and electronic format for six months after publication date, after which publisher retains non-exclusive right to continue to publish for life of the anthology. Length: 1,000 to 10,000 words. 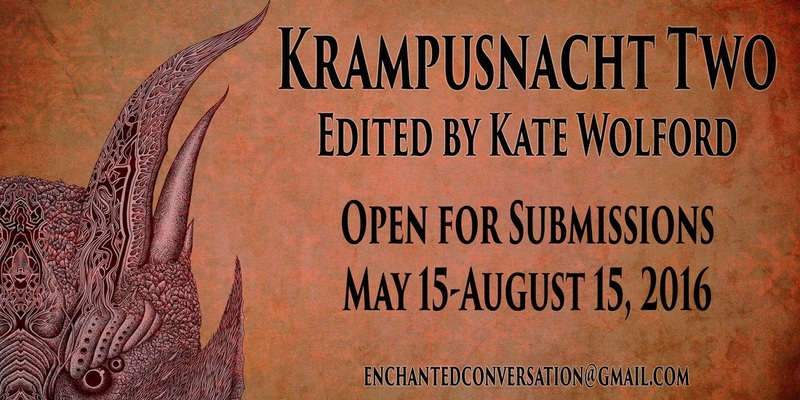 Submission method: Email cover letter and story to enchantedconversation[at] gmail [dot] com with the subject line “Krampus Anthology – story title.” Cover letter should contain your name, contact info (email), story’s title, and approximate word count. No need to summarize the story, let it speak for itself. (Please make sure to check the email address you send the story from--it makes the editing process easier.) Then paste the full story into the body of the email following your letter. Please make it very clear where paragraphs break — this means if your email doesn’t let you indent paragraphs, you’ll need to put an extra space between each paragraph for submission purposes. Do not send unrequested attachments. Note from Kate Wolford: I have a strict, no feedback policy about submissions, including why they were rejected. I also do not provide mid-process feedback. Fourth title in Rhonda Parrish's Magical Menageries anthology series from World Weaver Press featuring Fae, Corvidae, and Scarecrow. 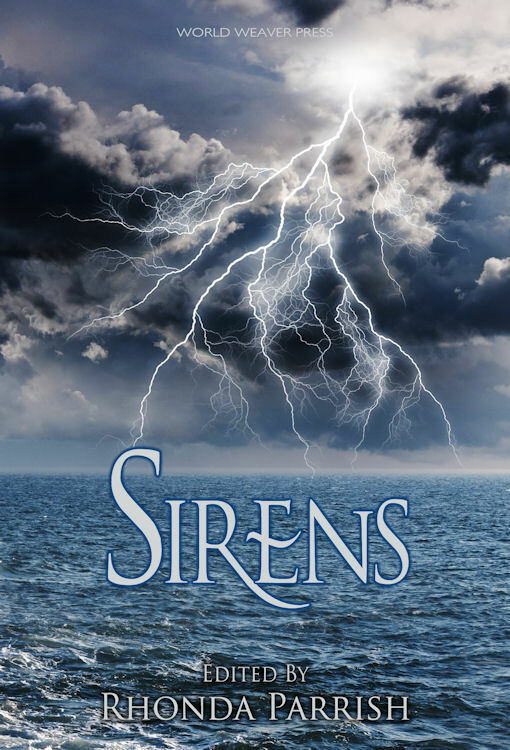 Whether from the sea or sky, sirens are beautiful, dangerous and musical, and we’re open to works that exemplify as well as those which defy those expectations. Sirens will be a book full of tales that evoke a vast spectrum of emotions toward these maidens, empathy, disdain, sorrow, awe and anger. I want stories of wretched and cursed sirens who fight against the roles imposed upon them and tales of those who revel in them. I’m hoping for pieces re-telling or playing upon the traditional myths and others which create their own mythologies, and all the little niches in between. Simultaneous submissions = okay. Sending us many submissions at once = no. In the bleak midwinter, the call of fairy tales can be especially irresistible. After all, fairy tales both take us out of our humdrum world and into the possibilities of what can be--or maybe even is. A fairy tale read in winter can help us dream through the the cold days and nights. 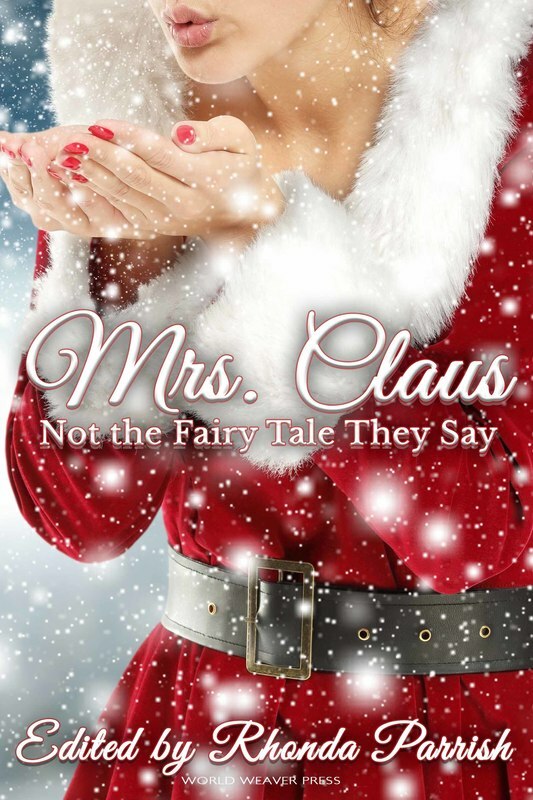 Yet, surprisingly few fairy tales are specifically set in winter. With Frozen Fairy Tales, we're hoping to remedy that. 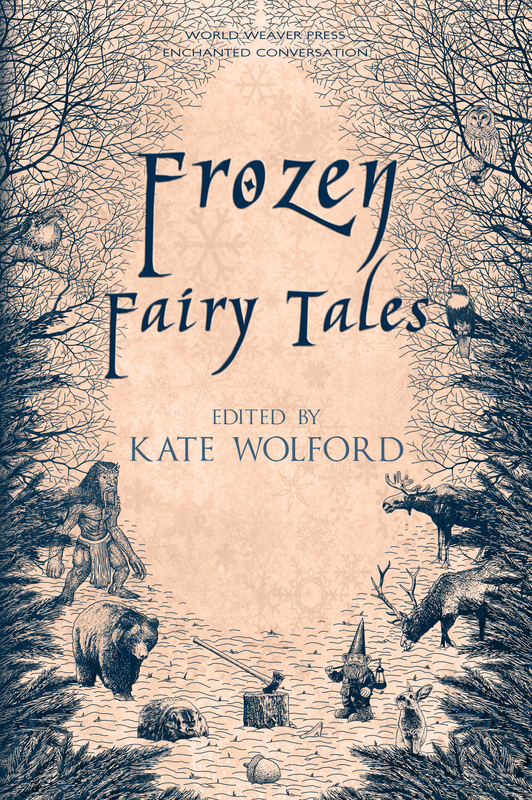 In a joint venture between World Weaver Press and Enchanted Conversation: A Fairy Tale Magazine, we're opening up to submissions for a fairy tale collection set in winter. Details are below. 1) You must be 18 or older to submit. 2) Submissions must be in English, but submissions from all over the world are most welcome. 3) No stories connected to the movie Frozen will be considered. It's a great movie, but this anthology is not at all about that film. 4) Stories centered on winter holidays are most welcome, but stories do not need to be holiday focused. Krampus-themed stories will be considered, but please do not resubmit stories that were previously submitted for the Krampusnacht anthology. 5) A sense of winter and its perils and possibilities must be part your story. 6) This is a fairy tale collection, which means the sensibility of the stories should evoke classic fairy tales. You do not need to retell famous fairy tales reset in winter, but you may. Nonetheless, the classics have been retold a lot lately, so fresher takes with more originality stand a better chance of being selected, as do retellings of obscure fairy tales. But think winter! 7) Please, no erotica, hard-core horror, sci-fi, or stories for a child-audience. This collection is aimed at an audience of 15 or older in age; It will not be a children's publication. 8) Open submission period: March 6-May 15, 2015. 9) Length: Under 10,000 words. 10) Submission method: Email cover letter and story to enchantedconversation [at] gmail [dot] com with the subject line “Frozen Fairy Tales Anthology – story title.” Cover letter should contain your name, contact info, story’s title, and approximate word count; no need to summarize the story, let it speak for itself. Then paste the full story into the body of the email following your letter. Please make it very clear where paragraphs break — this means if your email doesn’t let you indent paragraphs, you’ll need to put an extra space between each paragraph for submission purposes. Do not send unrequested attachments. Simultaneous submissions = okay. Multiple submissions = no. 11) Rights and compensation: Payment: $20. All contributors will receive a paperback copy of the anthology. We are seeking first world rights in English and exclusive rights to publish in print and electronic format for twelve months after publication date after which publisher retains nonexclusive right to continue to publish for a term. No reprints will be considered. That means only previously unpublished works will be considered. Our journey continues… World Weaver Press has agreed to publish a second volume of the Far Orbit science fiction adventure series. We are once again looking for modern space adventures crafted in the Grand Tradition. We are not looking for slavish imitations of past classics. Rather, we would like to receive stories that establish a new tradition in the much maligned sci-fi adventure genera — smart, modern stories built around the classic traditions. We are looking for adventure stories that are creative, readable, and memorable. We are also looking for midnight indulgences; exciting stories that transport you from the everyday grind and leave you wondrously satisfied. All adventure-based sci-fi genera are welcome but stay away from fantasy elements unless they are genetically engineered or cybernetic. Stories can begin on Earth but the major action should happen out there, beyond the edges of our blue marble. Dystopia (Mad Max) and fantasy-like adventures (John Carter of Mars) have to be very special to be included in this anthology. Please, no fan fiction. Because adventure stories often take more space to develop, World Weaver Press is accepting stories up to 10,000 words in length. Previously published stories are acceptable but we will not publish stories that have been previously anthologized. Want to know more about the editor’s preferences? 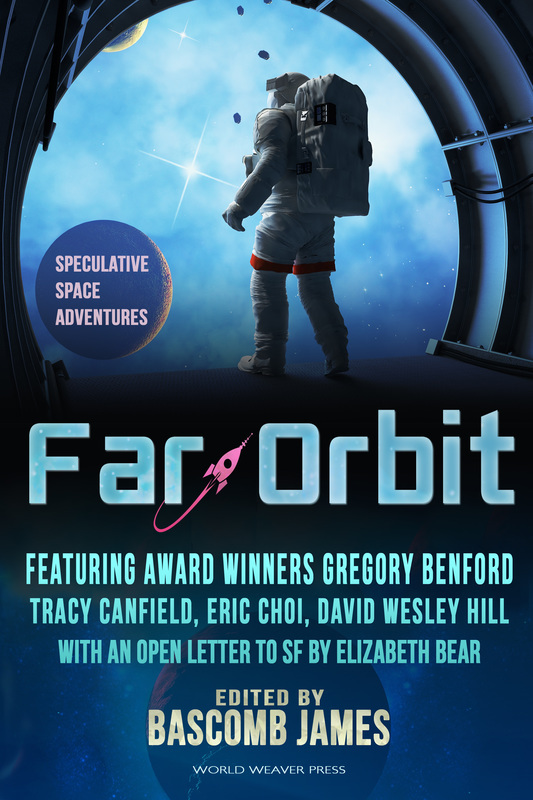 Check out the links at the bottom of this post or pick up a copy of the first volume of Far Orbit. Rights and compensation: Payment: $0.01/word. All contributors will receive a paperback copy of the anthology. For previously unpublished works: Seeking first world rights in English and exclusive rights to publish in print and electronic format for twelve months after publication date after which publisher retains nonexclusive right to continue to publish for a term. For reprints: Seeking non-exclusive right to publish in print and electronic formats for a term. Previously unpublished stories preferred; reprints will be considered. No previously anthologized stories. Open submission period: January 1 – March 31, 2015. Submission method: Paste the story into the body of the e-mail message. Include the approximate word count. Subject line: Apogee – [Title]. Send submission to: farorbit [at] worldweaverpress [dot] com. Simultaneous submissions = OK. Multiple submissions = No. 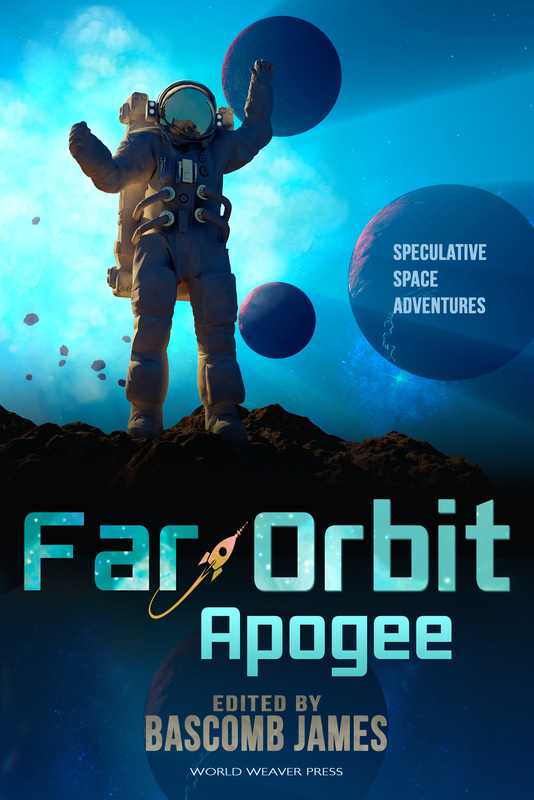 Far Orbit – Speculative Space Adventures -- the first Far Orbit anthology! 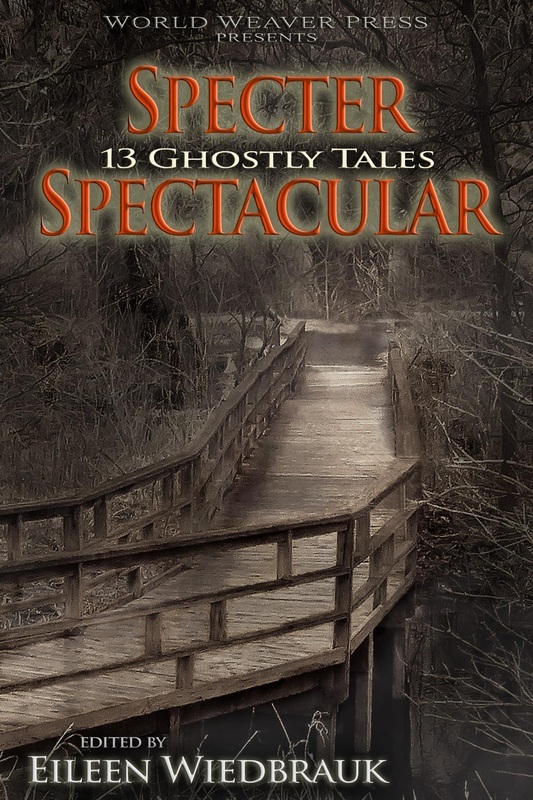 -- to see which stories made the cut in the previous volume. Listed at Duotrope, Ralan, Submission Grinder. 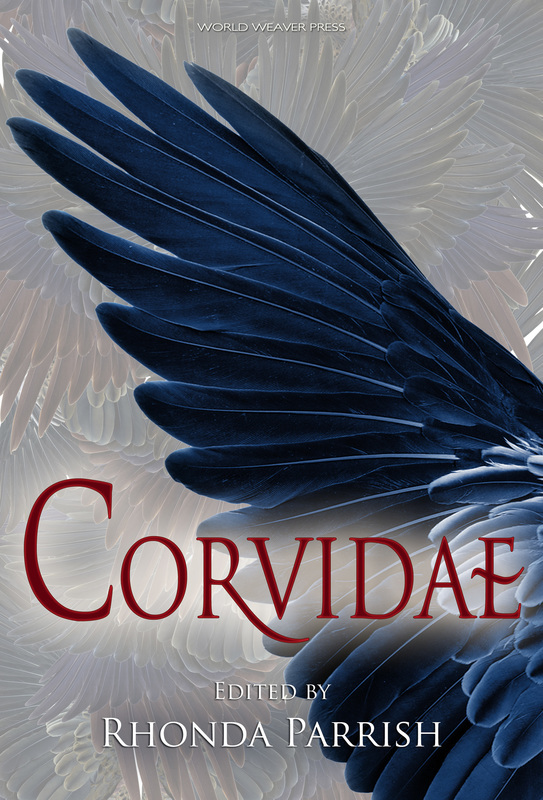 Corvidae are the family of birds which include such iconic species as crows, ravens, magpies, treepies, jackdaws, jays, rooks, and nutcrackers. They are known for their high intelligence (they use tools and recognize themselves in mirrors!) and appear in fiction and mythology all through the ages and in a great many different cultures as well. Corvids are seen as mystical creatures, known to be companions to both Odin and Apollo, believed by the Haida to have created the earth and credited (in the form of Raven the Trickster) for stealing fire and bringing it to earth, but they are also associated with death, disease and madness. According to legend, the Kingdom of England will fall if the ravens leave the Tower of London and so are a kind of good luck charm, but they are also associated with battle and war through their connection with The Morrigan and Badb from Irish mythology. Such paradoxical creatures, it’s easy to be fascinated by them, and a great many of us are. We are looking for well-written speculative fiction (fantasy, science fiction, horror with speculative elements, etc.) of up to 7,500 words long. Nothing gratuitously gory or violent. 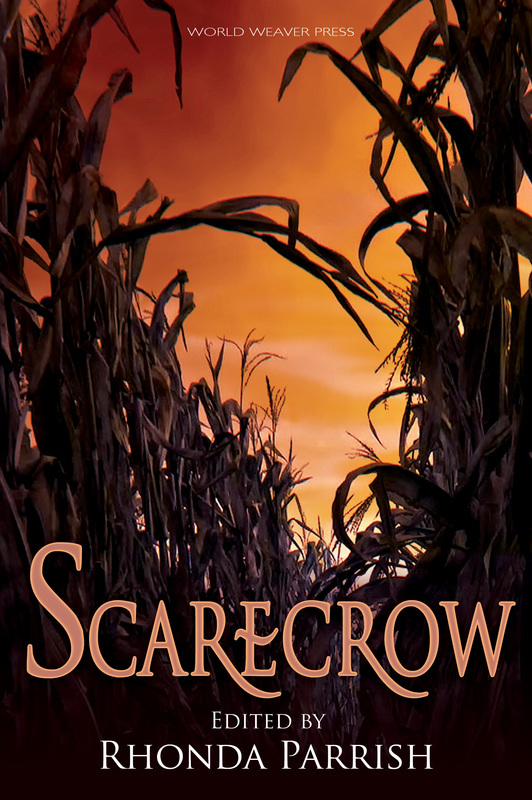 Corvidae will be published alongside a companion anthology, Scarecrow. We intend for the two books to be in conversation with one another and so would like some overlap between the authors included in each title. Thus we encourage writers to submit to both anthologies. Please do not submit the same story to both books (if the anthologist believes a story is more appropriate for one than the other she will let you know). About the anthologist: Rhonda Parrish is driven by a desire to do All The Things. She has been the publisher and editor-in-chief of Niteblade Magazine for over five years now (which is like 25 years in internet time) and is the editor of the forthcoming World Weaver Press anthologyFae. In addition, Rhonda is a writer whose work has been included or is forthcoming in dozens of publications including Tesseracts 17: Speculating Canada from Coast to Coast and Mythic Delirium. Her website, updated weekly, is at rhondaparrish.com. Scarecrow will be an anthology of well-written speculative fiction (fantasy, science fiction, horror with speculative elements, etc.) of up to 7,500 words long. Nothing gratuitously gory or violent. Have you ever noticed that, despite the name, there is often a conspicuous absence of fairies in fairy tales? Historically speaking fairies have been mischievous or malignant. They’ve dwelt in forests, collected teeth or crafted shoes. In Fae, we want stories that honor that rich history but explore new and interesting takes on fairies as well. We want urban fairies and arctic fairies, steampunk fairies, time-traveling and digital fairies. We want stories that bridge traditional and modern styles and while we’re at it, we want stories about fairy-like creatures too. Bring us your sprites, your pixies, your seelies and unseelies, silkies, goblins or gnomes, brownies and imps. We want them all. We’re looking for lush settings, beautiful prose and complex characters. This is not a children’s anthology: The anthology is meant for a readership of 16-and-up (general adult). We will gladly consider fairy-based horror. If we say it’s adult fiction then why “16-and-up”? It’s a completely arbitrary number based on the age some of us here at WWP were when we first read A Midsummer Night’s Dream. Fairies and Shakespearean innuendo, oh my! 9/30/2013: Update from the anthologist. 11/12/2013: Update from the anthologist. Rights and compensation: Payment: $10 and paperback copy of the anthology from World Weaver Press. We are looking for previously unpublished works in English. Seeking first world rights in English and exclusive right to publish in print and electronic format for six months after publication date, after which publisher retains nonexclusive right to continue to publish for life of the anthology. You know the Jolly Old Elf of Christmas, right? Of course you do. You can’t avoid him. Yet, Santa Claus isn’t just a kindly old expert at breaking and entering and leaving gifts he didn’t actually buy for the children of a house. At least he isn’t in Austria and many other parts of Europe. In these ancient places, where, perhaps, the old, old gods still add a touch of mischief, Krampus is the angry, punishing sidekick of St. Nicholas (Santa’s counterpart in much of Europe). Known for his willingness to punish rotten children, Krampus might even be considered Santa’s dark side or evil twin. Krampus is the sort of guy more and more North Americans want to explore. He’s definitely having a moment this side of the Atlantic. 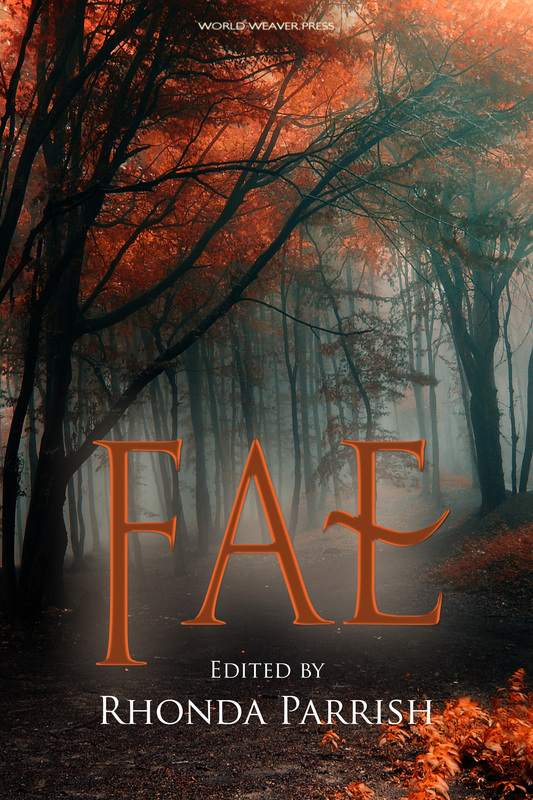 To that end, World Weaver Press and Enchanted Conversation: A Fairy Tale Magazine are pleased to announce a joint venture: An anthology of Krampus short stories. 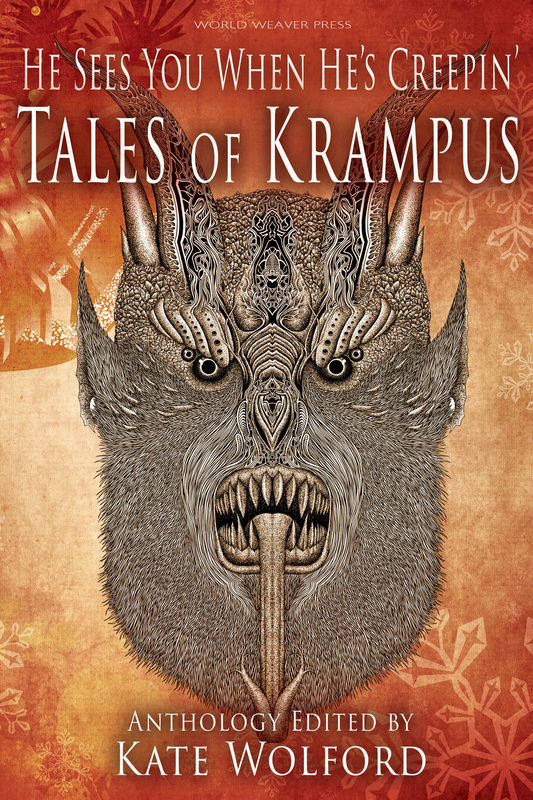 We hope you’ll explore every possible Krampus angle via short stories. He’s a nasty old dude, and we hope your imaginations will get the better of you. Rights and compensation: Payment: $10 from Enchanted Conversation and paperback copy of the anthology from World Weaver Press. We are looking for previously unpublished works in English. We are seeking first world rights in English and exclusive right to publish in print and electronic format for six months after publication date, after which publisher retains nonexclusive right to continue to publish for life of the anthology. More details to follow at Enchanted Conversation! Editor’s update 7/10/13: Would love to see more psychological horror in the submission pile. Seeing a lot of cute stories a ten-year-old could read and blood-and-gore stories, both of which are fine, but we seek to build the mid-range. The journey continues… World Weaver Press is looking for modern space adventures crafted in the Grand Tradition. We are not looking for slavish imitations of past classics. Rather, we would like to receive stories that establish a new tradition in the much maligned sci-fi adventure genera — smart, modern stories built around the classic traditions. Want to know more about the editor’s preferences? Read Bascomb James’s article on what draws him to SF in the Grand Tradition. Rights and compensation: Payment: $0.01/word. All contributors will receive a paperback copy of the anthology. For previously unpublished works: Seeking first world rights in English and exclusive rights to publish in print and electronic format for twelve months after publication date after which publisher retains nonexclusive right to continue to publish for a fixed number of years. For reprints: Seeking non-exclusive right to publish in print and electronic formats for a fixed number of years. Previously unpublished stories preferred; Reprints will be considered. No previously anthologized stories. Open submission period: January 1 – March 31, 2013. Attention romance writers! 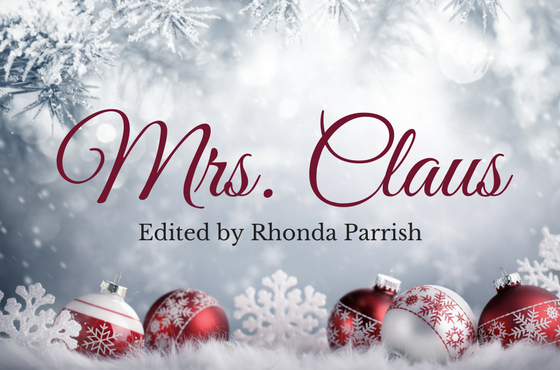 Do you have a novella that captures the magic of the holiday season? We want to see it! We’re looking for winter romances with a speculative element — supernatural or paranormal beings, magic, doors to other worlds, inexplicable serendipity, etc. 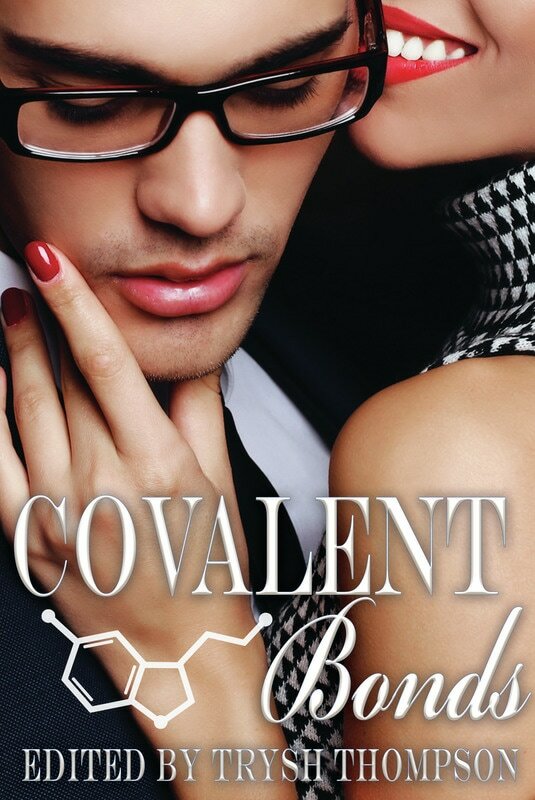 — at the novella length. Submissions accepted Dec. 1, 2012 – Jan. 31, 2013 — deadline extended! — for publication during the 2013 holiday season. Stories must have a winter element. Preference for stories where the winter holidays play an important role in the story: Christmas, Hanukkah, New Year’s, Chinese New Year, Thanksgiving, winter solstice, yule, other winter holidays (real or invented). Listed at Duotrope.com. Theme: New takes on the classic ghost story Submission period: May 7-July 7, 2012. We encourage writers to report their submissions/responses on the Specter Spectacular Duotrope listing.